Should You Let Junior Play High School Football? Football, a high-impact contact sport, is wildly popular among young American males despite the fact that it accounts for a sizeable number of injuries, including a few fatalities, each year. According to The American Journal of Sports Medicine, high school football is one of the most popular sports among male high school students in the United States, with an estimated 1.5 million high school and middle school boys participating. 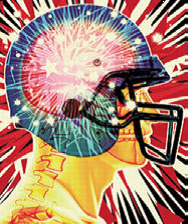 In an annual survey of football injuries, prepared by the chairman of the American Football Coaches Committee on Football Injuries and by the Assistant Director of the National Federation of State High School Associations, two direct fatalities attributable to brain injuries and 11 indirect fatalities (five heart related, five heat stroke and one blood clot related) were reported for the 2011 high school football season. For the period 1995-2004, 44 fatalities were reported for head injuries and one for cervical spine injury for high school football participants. But news of serious injuries doesn’t seem to deter either interest or participation in the sport. Gallup polls indicate that football is by far the most popular sport to watch in this country, with a 2006 poll giving the sport a 43 percent TV rating (baseball, the second most popular sport, got a 11 percent rating). Football also has a high participation rate; 4.2 million high school boys actively participated during the 2011 season. Our youth emulate and admire pro football players whose personas are ubiquitous from the games played on TV (nearly all day Sunday, Monday night and now Thursday night) to car and after-shave commercials. We are told the game builds character and teaches the value of discipline, focus, persistence, and teamwork –all valuable life skills. But football also has a downside. The danger to young football players are the “hits” – incurred by players when blocking or making tackles – that are inherent to the game of football, and the abnormal and excessive repetitive brain trauma that results. One Boston University study estimates that the typical high school player receives about 1,000 blows to the head each season, while BU researchers also found that athletes who play both offense and defense during games potentially sustain up to 2,000 sub-concussive impacts a season. A sub-concussive impact is an impact that does not produce any clinical concussion symptoms but nevertheless may still be damaging to the brain. A report by the Committee on Sports-Related Concussions of the National Academy of Sciences found that football not only has by far the highest rates of concussions at the interscholastic level, but also that the average high school player is nearly twice as likely to suffer a brain injury as a college player. One study of high school athletes found that all sports were at risk for concussions with boys’ football being the highest at 63 percent. In the Cureus article “Chronic Traumatic Encephalopathy as a Consequence of Repetitive Sports Head Injury: A Review,” authors Michael Galgano, Robert Cantu, and Lawrence S. Chin conclude that “[w]ith more than a million teenagers competing in football every year, it is clear that the risk of CTE (Chronic Traumatic Encephalopathy) looms as a potential public health disaster.” CTE is a devastating progressive degenerative brain disease that is very similar to Alzheimers; it is associated with memory loss, confusion, impaired judgment, impulse control problems, aggression, depression, and, eventually, progressive dementia. CTE can only be diagnosed after death. An ESPN study, updated at the end of 2012, states that CTE occurs when repetitive head trauma produces abnormal proteins in the brain called “tau.” The proteins form neurofibrillary tangles that can effectively strangle brain cells. This column has a simple purpose: discuss issues that affect the lives, well-being and state of mind of those who must live and cope with a disability.